15.5" x 8" x 17.5"
Seemingly simple objects often have great significance. In a culture with few material goods, a humble piece of furniture separates an important person from a commoner. 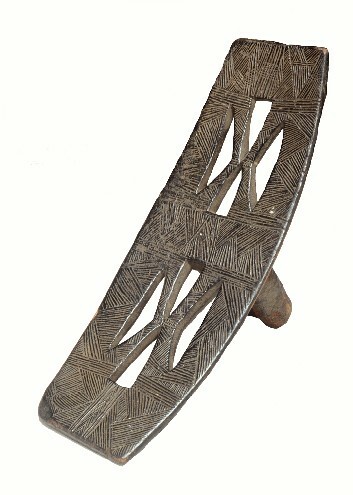 This object functions in two ways: as an upright stool balancing on a single leg and as a backrest leaned over on one side. The fortunate owner (perhaps a chief) would lounge across the backrest like an odalisque. Mongo stools are characterized by the incised geometric patterning on the surface of the seat. The stool's dark patina and wear on the seat's edge suggest that this stool was used often. Bibliography: Bocola, 1995, figs.90-93; National Museum of African Art, Smithsonian, 2002, ob.73.7.451; Sieber, 1980, p.136.